The F-35 Joint Strike Fighter (JSF) is a next-generation military fighter aircraft designed by the United States and the United Kingdom. It is intended to replace the current generation of strike fighters, particularly the vertical take off and landing (VTOL) Harrier jump jets: the AV-8 Harrier II (US), Harrier GR7/9 (UK), and the Sea Harrier (UK), along with the conventional A-10 Thunderbolt II, F/A-18 Hornet and the F-16 Fighting Falcon. It will be a multi-role strike fighter (a plane with a strong emphasis on close air support and tactical bombing as well as being capable of air-to-air combat), and will make considerable use of stealth technology in that it will be almost undetectable (stealthy) to X-band radars (short-range tracking systems) in the forward hemisphere but not particularly stealthy in the rear hemisphere and not stealthy to L-band radars (long-range search systems) in either hemisphere. It is currently in production lead by Lockheed Martin, along with partners Northrop Grumman, BAE Systems, and Smiths Aerospace. Three variants are planned: the Conventional Takeoff and Landing (CTOL) F-35A for the U.S. Air Force (USAF); the Short Take-Off Vertical Landing (STOVL) F-35B for the U.S. Marine Corps (USMC), the Royal Air Force (RAF) and the Royal Navy (RN); and the carrier-based (CV) F-35C for the U.S. Navy (USN). The joint development program is aimed at controlling development and production costs; the three variants have over 80% of their parts in common. 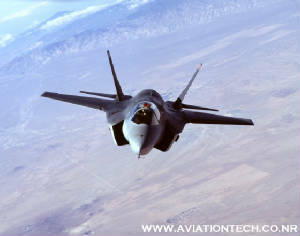 The designation "F-35" was chosen at the Department of Defense level; in proper sequence the aircraft should have been designated F-24A, following the YF-23 Black Widow II. The F-35, expected to be ready for service in 2011, is scheduled to begin replacing USAF A-10 Thunderbolt II's and F-16's in 2011, and Marine Corps AV-8B Harriers and F/A-18s in 2012. In two bomb bays (current planned weapons for integration) &#8212; one AIM-120 AMRAAM, AIM-9X Sidewinder or AIM-132 ASRAAM internally on the inside of the bomb bay door and one air-to-air or air-to-ground weapon in each bomb bay. These could be AMRAAM, the Joint Direct Attack Munitions (JDAM) &#8212; up to 2,000 lb (910 kg), the Joint Stand off Weapon (JSOW), Small Diameter Bombs (SDB) &#8212; a maximum of 4 in each bay, the Brimstone anti-armor missiles, Cluster Munitions (WCMD) and High Speed Anti-Radiation Missiles (HARM). The MBDA Meteor air to air missile is currently being adapted to fit internally in the missile spots and may be integrated into the F-35. At the expense of being more detectable by radar, more missiles, bombs and fuel tanks can be attached on four wing pylons and two wingtip positions. The latter can only take short-range air-to-air missiles, while the Storm Shadow and Joint Air to Surface Stand-off Missile (JASSM) cruise missiles can be carried in addition to the stores already integrated.